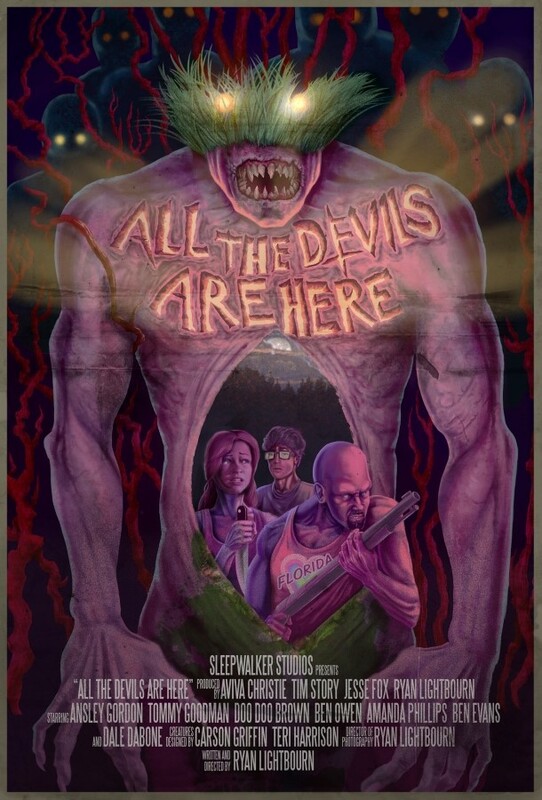 All the Devils Are Here (previously known as Sleepwalkers) is directed and written by Ryan Lightbourn (Roid Rage) and was filmed on a budget of $30,000 over a two week period. Despite the low budget and swift filming time this is a quality production and features some great looking special and practical effects both for the creatures and the victims they kill. Ryan states that this film was made as an ode to straight to video horror films of the 80's and early 90's and that does show in the film, especially with the soundtrack that is ripped straight out of the 80's. There was a timeless feel about All the Devils Are Here for the most part, indeed I thought it was set in the past for quite a while until a character pulls a mobile phone out their pocket. It couldn't be much of a homage without a cheesy montage or two and there are a few here, I loved the early ones of the friends driving around in their yellow jeep, then when things get real there is a neat little montage of them preparing the house they are at for attack. The camera work on the other hand is all modern in style, it is crisp and clean, a nice compliment to the visuals; much of this takes place in the lazy sunshine of a nostalgic era with some nice saturation used. I did find that the final third that takes place at night was a lot harder to see what was going on. At times it seemed a bit too dark, but this did help immensely with having the already great special effects and make-up effects look even better. The camera had a habit of being a bit too close up to characters when they were fighting which I think contributed to the few moments when I struggled to make events out. There isn't any bad acting to be found here, instead you have a bunch of actors who may sometimes have ridiculous lines but they play into their roles. Sometimes of course the lines are brilliant, my favourite being when someone exclaims; "What in the fu*kity fu*k fu*k is that fu*king thing!?". Instead it is the characters themselves that I didn't always like. Owen is perpetually paranoid about Evan's intentions towards Kate, while Evan himself may be a bit shy and geeky but he doesn't really come across as that decent a person either. Also Tre (Doo-Doo Brown) was pretty irritating at times with his cliche way of talking that sometimes came across as a pale imitation of Jules Winnfield from Pulp Fiction. None of the characters are particularly likeable but this leads to a nice Night of The Living Dead moment when they have to put aside their differences to work together and protect the house they are in from being breached. The plot for All the Devils Are Here is pretty simple, but it does reflect the style of horrors that I think Lightbourn was going for, I have seen many 'creature features' like this but I still found this one to be entertaining, as it is far better made than the majority of the straight to video horrors he was influenced by. I had some issues with the general story in how far ahead of the viewers the characters were getting. After just three of the six strong group have encountered just one rabies like infected crazed woman all of them start to talk about how what is happening is the start of a worldwide vampire/zombie apocalypse. Sure they might eventually maybe be proved right, yet at that point in the movie there was no evidence to point towards that in the slightest. This leads to them setting up heavy defences for no reason at all (in terms of what the characters actually knew at that point in the movie) aside from a local myth one of them mentions and which everyone believes after not much convincing. This was only a small issue I had, and to avoid immersion breaking I put it down to mass hysteria. I should also mention that I liked this enough before the horror started that I recall thinking at the time that if it was just 90 minutes of friends hanging out I would have probably still enjoyed this due to how it was filmed. On to the very best part of All the Devils Are Here which is the great special effects that are all done practically. The monsters I at first thought were zombies, the early ones that appear are infected humans in the beginning stages of transforming. Instead I think they are some sort of vampiric type monster, afraid of the light they only come out at night, they reminded me a lot of the creatures from The Descent. The darkness helps shield these cool looking creatures though we get some great close ups at times. It would have been nicer to see more of the infected humans, felt at times opportunities (as cliche as they would have been) were missed with infected characters dying off camera rather than turning. A scene in which a heavily pregnant creature gives birth to a rancid looking offspring was a highlight in terms of how great the creature design was. On the victim side of things there are some brutal looking special effects that include at least one head being ripped off its body, and an awesome looking one later on of a character's jaw being ripped straight off it's head! While All the Devils Are Here doesn't really do much to stand out in terms of the story it is telling it does remain enjoyable thanks to the solid directing, a killer soundtrack and mostly good editing. It leads up to an action packed finale that is a bit dark, but stays enjoyable due to great special effects and great creature design. It left me not wanting more, but satisfied at what I had seen. All the Devils Are Here is now out on most VOD platforms that includes iTunes, Amazon, Sony Playstation, XBox Live among others.